For my final interview in the QPF series, I had the absolute pleasure of speaking to a lady who has had a profound influence on my own work, Jacqueline Turner. Jacqueline is a QPF favourite, so it is wonderful that she is returning for her third visit. Your first visit to Australia and QLD Poetry Festival was back in 2005 as the inaugural Arts QLD Poet-in-Residence. What is your memory of that first visit and how did it change you as a person and poet? That visit had an incredible effect on all aspects of my life. First, what stands out in my memory is the amazing people I met from getting off the plane and going straight to lunch with a room full of poets at the Red Chamber to the folks at the Judy, to all the small town writers up the north coast to everyone who came out at NOGO in the outback and then to cap it off, all of the spectacular poets who performed at the festival to huge sellout crowds. Literary types, musicians, performance poets, bush poets all mingling in green rooms and then pushing it out on stage. It was a version of a poetic life I couldn’t have even imagined existed. The land had a huge impact as well — my work deals with place so the tectonic shift of locale for me was significant. The light, look at the light! I kept saying. I was also slightly traumatized by the kangaroo road kill on trips to regional Queensland and mesmerized when the jacarandas in New Farm Park burst out. The stars were different in the outback and I felt like I was on the edge of the earth, could feel the curve of the planet. The time and space to work on my writing changed everything for me. Personally, it allowed me to step out of my life for a moment and reinvent myself outside the domestic sphere I had inhabited since my early 20s. In terms of my poetic practice it created a loosening, an opening up to the vast potential of language beyond the ways in which I typically operated. I engaged with the lyric form in a new way and the credibility of the position gave me even more confidence to go with my particular poetic inclinations. I stopped censoring myself. I experimented with connections to music that events like SpeedPoets provided. The flow of the river my hair blowing on the CityCat and me opening. The world. Really it meant everything. Your residency had a profound effect on the Brisbane poetry community too and in many ways, set the bar for every other residency to come. You have also been a return visitor to QPF since your first visit in 2005, so what is it about the festival that keeps you coming back? It was great to see such tangible and vibrant manifestations of poetic communities when I arrived in Brisbane the first time and it only seemed to get better and better every time I returned. If my residency did anything, it was to merely encourage what was happening in Brisbane and regional Queensland already and to just reinforce the idea that community is vital to creative practice. It was also really important to me to come back and launch my book Seven into Even since I had written much of it during my residency and that QPF accommodated that desire was completely thrilling to me. QPF is unlike any festival or poetic event because it combines an intimate community feel with the expansiveness of performance with huge but particularly attentive audiences. To be in the presence of so many people who are genuinely seeking a poetic experience is intoxicating and gratifying. I could feel the way that certain lines were landing in the room. And then to combine that with the multi-disciplinary aspect of the festival made the conversations around the main events, in the lobby and out for drinks after, incredibly nuanced. It is a unique experience that I keep subjecting to the forces of repetition for my own pleasure! We are so glad you do Jacqueline! And again, there are many fine Canadians sharing the QPF stage with you. 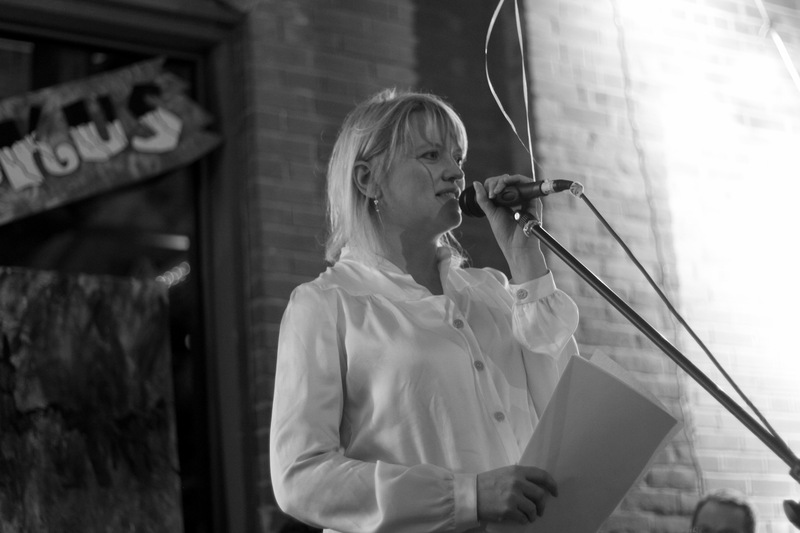 In fact, QPF has had a real love affair with Canadian poets since your residency. What creates that spark of connection between Canadian poets and our audiences? I think it’s the similar but different kind of thing. We have shared concerns resulting from similar histories with aboriginal people and the land. Also cultural considerations in relation to the dominant American culture. We all bring varying perspectives on those kinds of concerns. Aesthetically we push in a myriad of ways too that seem to both connect and echo with and maybe sometimes even provoke QPF audiences. And those audiences are amazing! Every Canadian poet I’ve talked to about being on the QPF stage is wowed by the particular responses to their work, but also to the fact that poetry is so important to this city, this country. That spark also comes from the opportunity for conversations around the pleasure and practice of writing, as well as the development of some genuine friendships that exceed distance in the age of social media. I’d also be remiss without acknowledging the support of the Canada Council of the Arts which helps to fund travel to bring lucky Canadian poets to Brisbane over the years as well as the incredibly dedicated work of people at the QWC. This visit, Australian audiences will get the opportunity to hear you read from The Ends of the Earth (ECW Press, 2013), which is really exciting. I am also keen to hear about any other new projects you are working on that QPF audiences may get a preview of. Jacqueline Turner has published four books of poetry with ECW Press: The Ends of the Earth (2013), Seven into Even (2006), Careful (2003), and Into the Fold (2000). She reviews for the Georgia Straight and lectures at Emily Carr University of Art + Design. She was the inaugural Arts Queensland Poet In Residence.